September is officially in swing. America’s youth are back at their desks; its adults are back at the grindstone. Here in Baltimore, a late-summer heat wave has us in siege… like a fever that won’t let go. Marketwise, many consider September a calm before dreaded October. The Panic of 1907… the Crash of 1929… “Black Monday” 1987 — all fell in October. Today we haul the defendant into the dock… interrogate its record… and announce a verdict. Stocks were “mixed” today, as the phrase has it. The Nasdaq was down 96 points. Twitter CEO Jack Dorsey and Facebook COO Sheryl Sandberg appeared before Congress today. There they got a good grilling about foreign election meddling and their efforts against it. The S&P was down eight points today… while the Dow Jones worked a 22-point gain. But returning to the question of the hour… is October the great menace we’ve all been led to believe? October’s bankrupt reputation appears more a string of sour luck; its conviction based on circumstantial evidence. In further vindication of October, the folks at Yardeni Research prove the average October market return is a positive 0.4%. Meantime, Investopedia informs us that more bear markets have ended in October than begun in October. Downturns in 1987, 1990, 2001 and 2002 — all reversed in the year’s tenth month. We must conclude an innocent man has been pitched into infamy… and sent to the gallows on false charges. But if October isn’t the menace many believe, does another month rise in its place? “Since the Dow Jones industrial average was created in the late 1890s,” financial columnist Mark Hulbert notes, “September has produced an average loss of 1.1%. Like the Dow Jones, September’s ill luck covers the S&P. Bank of America Merrill Lynch strategist Savita Subramanian has examined the S&P’s median September return since 1928. October is a month of honey in comparison. Perhaps it is time to replace the “October effect” with the more deserving “September effect”? But no more talk of Septembers past. After closing August at or near record highs, stocks have entered September with a slight limp. Of course… we are not one week into the month. North Korea appears to be playing with firecrackers again. An emerging-markets crisis issuing out of Turkey remains a possibility. There are trade wars to consider. Meantime, stocks are wildly overvalued on key historical metrics. 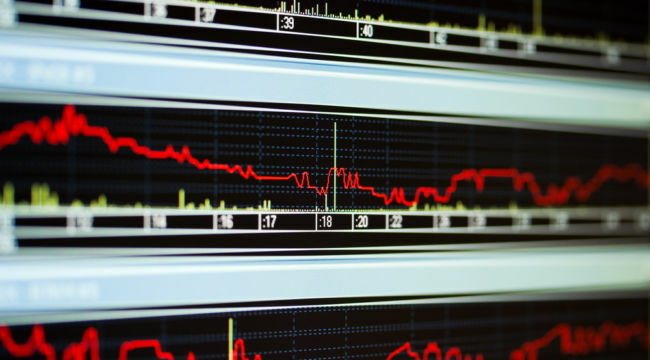 Given the rise in uneven patterns globally, it is clear that markets are entering an increasingly fragile period. Expect rising volatility this fall to become central to even the mainstream financial media outlets. Words to the wise, perhaps — for the wise. “Sometimes right, sometimes wrong and always in doubt, we just try to connect the dots,” in the words of our co-founder Bill Bonner. We have even suggested markets could “melt up” from here — before melting down sometime next year or the year after. 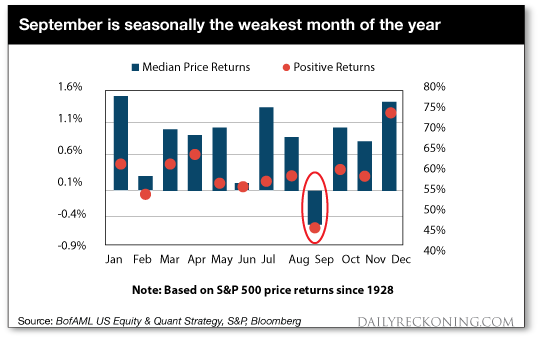 September is one of the most dangerous months to speculate in stocks. July, January, April, November, May, March, October, June, December, August — and February.